How much faster is a modern workstation for Adobe Photoshop CC 2017? There is no doubt that a modern workstation will be faster than one that is more than a year or two old, but the advancement of computer technology has certainly slowed in recent years. 10 years ago, it was not uncommon to see massive performance gains generation to generation, but today we often see much smaller 10-15% performance gains whenever a new product is launched. Some areas (such as storage) are still showing massive raw performance gains, but when you benchmark the new products in a real-world scenario even these are not quite as impressive as what we used to see. These 10-15% gains per generation are not something most people will get excited about and make it difficult to determine how much of a performance gain you might see if you were to replace your 2, 3, 4, or 5 year old workstation with a new one. To try to answer this question as objectively as we can, we decided to directly compare five workstations using the highest end components over the past 6 years. These configurations were designed first around the various Intel CPU generations (using the fastest CPU available at launch), followed by the fastest GPU that was available at that time. After that, we simply used the highest capacity of RAM supported by the platform along with the SSD model we most commonly sold at that time on Puget machines. On the software side, we will be using Windows 10 Professional and the latest version of Photoshop 2017 on each system to ensure that any performance differences we see are strictly hardware level rather than being influenced by different software versions. Unfortunately, since we don't always keep old hardware around once it is obsolete, we had to dig through our warehouse, closets and even home PCs to put together these systems. This means that some configurations are slightly off from what they ideally should be (such as using a GTX 580 instead of a GTX 680 and only a i5 3570K for the April 2012 configuration) but despite these small discrepancies our testing should fairly accurately show how a modern workstation compares to one that is 2, 4, 5, and 6 years old. To start our testing, we looked at over 20 different actions including both general task like opening and saving files as well as a variety of filters (blurs, sharpen, lens correction, liquify, etc.) and a few other miscellaneous actions. Because of the high number of different tests, we are going to look at the results as an overall average across all of the tested actions. Looking at the average from the 20+ actions we tested, we get a pretty good idea of how much faster a modern workstation is for general Photoshop usage. If you go back just one generation, a system from the middle of 2015 is only going to be about 10% slower than a new system which is not terribly exciting. However, a workstation from 2013 is going to be around 25% slower than a modern workstation which means that if it takes you 10 seconds to open a Photoshop file or apply an effect on a 2013 workstation it should only take around 7.5 seconds on a modern workstation. This isn't anything dramatic, but it will certainly add up very quickly throughout a workday. If you go back even further to a workstation from 2011, that machine should be just a bit more than half the performance of a modern workstation. Again, if it takes you 10 seconds to complete an action in Photoshop on a workstation from 2011, a modern system should be able to complete that in about 6 seconds. This is a huge difference in performance! Going back just one CPU generation to 2015, there is only about a 10% difference between a machine from that time and a modern 2017 workstation. However, if you go back to 2013, a workstation from that time is only 64-76% as fast as a modern workstation. If you look at the raw results, you will see that this means a photomerge of 6x 80MP images that takes 6.5 minutes on a 2013 workstation takes just 4 minutes on a new 2017 workstation. Going back even further, a machine from 2012 is only about 60% as fast as a modern workstation and one from 2011 is only 43-61% as fast. Again looking at the raw results, where a modern system takes just 4 minutes to do a Photomerge of 80MP images, a machine from 2011 will take a bit more than 9 minutes. Overall, the results are not that much different than the results from the previous two sections. There is only a small difference in performance going back to 2015, but the difference gets larger and larger the further back you go. Especially if you have a workstation from 2013 or older, you can expect pretty large performance gains by upgrading to a modern workstation. How much faster is a new 2017 Photoshop workstation? 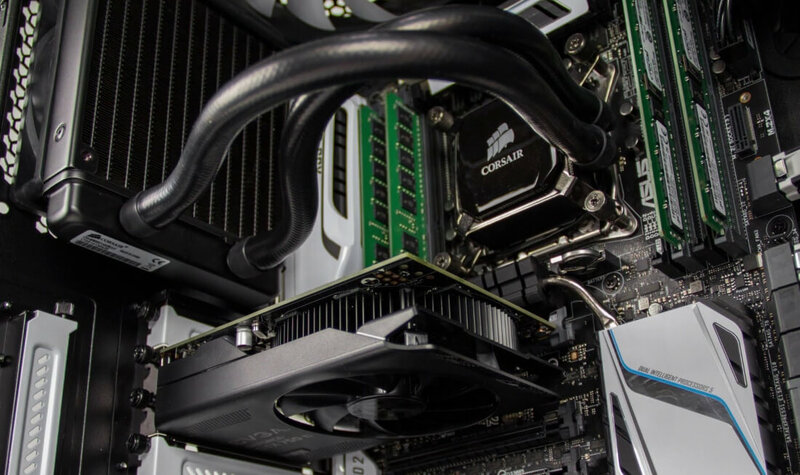 If you have a fairly new workstation that is only a few years old, it probably isn't necessary to upgrade unless your workflow requires the best possible performance. If you have a machine from 2013 or older, however, you could be looking at some very significant performance gains. You might not see a doubling in overall performance even if you have a workstation from 2011 but it will be pretty close and should significant improve your productivity. Keep in mind that we are looking strictly at high-end workstation from each time period. If you have an off-the-shelf workstation, you would actually probably see even larger performance gains than we showed since those workstations tend to not be nearly this high-end. For example, back in 2011 a typical workstation likely used platter storage drives rather than an SSD which would make opening and saving files much longer than what we saw in our testing. In addition, the majority of older workstations are not going to have nearly as powerful of a GPU as what we tested with or as much RAM. Overall, we hope that this testing helps you decide whether you should upgrade to a new workstation or not. If you found it helpful and want us to do more testing like this please let us know in the comments section. We highly value your feedback and love hearing your suggestions!